R-68 no. 2750 on "D" service, BMT West End Line at Fort Hamilton Parkway. Photo by Zach Summer, January 2012. The West End Line began service in 1864 as a steam railroad called the Brooklyn, Bath and Coney Island between 25th St and 5th Ave in South Brooklyn to the Bath section of Brooklyn, which in today's map would be 65th Street and New Utrecht Avenue. In 1867, the steam line reached Coney Island, making it the first steam railroad to reach the Atlantic Ocean at this location. In 1885, a branch was built from 5th Avenue and 38th Street to Second Avenue and 39th Street as a ferry connection. Also in 1885, the BB&CI was reorganized into the Brooklyn, Bath and West End Railroad. In 1889, when the 5th Ave El reached 5th Ave and 36th St, the railroad was abandoned north of 36th St. Trains then ran from 2 branches, one from the ferries and one from the junction of the 5th Ave El, to Tivoli's Hotel in Coney Island. The two branches joined in West Brooklyn, which is approximately where New Utrecht Ave & Ft Hamilton Pkwy meet now. In 1893, the line was electrified with trolley wire and merged with the Atlantic Avenue Railroad which itself merged with the Nassau Electric Railroad in 1898. In November of 1893, the Atlantic Avenue Railroad started running streetcars on the line, and in early 1894, railway post office mail was begun on the line to Coney Island. In 1901, BRT elevated trains began using the surface West End trackage, using trolley poles. Service connected to the West End from a ramp of the 5th Avenue elevated at 36th Street. Called the "5th Ave - West End Line", it ran using third rail from Sands St or Park Row to 36th St and then by trolley pole to Coney Island. 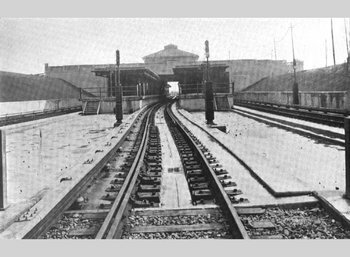 Originally, the West End Line has its own Coney Island terminal, but later in the 1900s shared a terminal with the Sea Beach line. 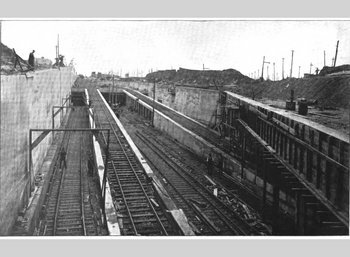 In 1919, both the Culver and West End Lines moved to their new terminal, the present-day Stillwell Avenue and Coney Island BMT stop. 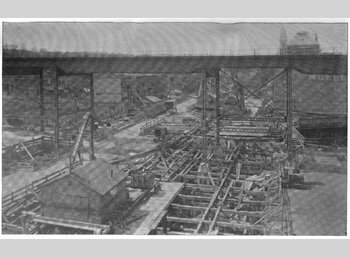 In 1917, as part of the Dual Contracts, the West End El as we know it today was built, replacing the surface route. Streetcars replaced trolley powered El cars on the surface until the trolley line was closed in 1947. Steel cars from the 4th Avenue subway to Chambers St via the Manhattan Bridge replaced the wooden 5th Ave El cars, and the 5th Avenue El was closed in 1940. Remains of these ramps can be seen today just north of the 9th Avenue and 39th Street station. Some service in Manhattan ran as far north as Union Square in 1917, and then to Times Square in 1918. By 1919, part time service was available at 57th St and 7th Ave. Because of a shortage of steel cars, shuttles consisting of wooden equipment ran between Bay Parkway and Coney Island at rush hours until 1953. Rush hour trains consisting of steel cars also ended their runs at Bay Parkway. In 1918, the Malbone St. wreck on the BRT Brighton Line killed 97 people. As a result of the wreck, the BRT went bankrupt and was reorganized into the BMT (Brooklyn - Manhattan Transit Corporation). The West End Line then became a BMT property. The West End Line was unified into the New York City Transit System on June 1st, 1940, after BMT shareholders agreed to a $175 million buyout from the City of New York. Through the 50s and 60s, off-hour service was reduced on the West End Line. At some point in the mid-late 50s, the West End express Manhattan Bridge through service was discontinued during late night hours, replaced first by service via tunnel to Chambers St, and later by a shuttle to 36 St/4 Ave. The West End Local (also sometimes called the West End Short Line, and later the TT) was originally a rush-hour only operation; midday service started when the Culver Line through service ended (around 1958 or 1959), at which time the midday West End Express (T) train through service was discontinued. In the mid 60s, Sunday through service was eliminated, replaced by a Coney Island to 36 St/4 Ave shuttle. TT trains terminated at Bay Parkway in rush hour (Bay Parkway to Chambers St. via tunnel), and the T expresses ran over the Manhattan Bridge to 57th St or Astoria. During midday weekdays, the T express didn't operate and the TT ran all the way to Coney Island. On November 26th, 1967, as part of the opening of the Chrystie Street connection, West End service was rerouted up 6th Avenue. Rush hour trains terminated at 168th St; normal hour trains terminated at 57th St and 6th Ave when it was opened July 1st, 1968. The West End is serviced by the D ("B" until Spring 2004) route and there is only local service between Coney Island and 9th Avenue. Until 1996, there was M train service to 9th Avenue during midday hours (after being rerouted off the Brighton Line in 1988 because of the "temporary" Manhattan Bridge work); currently M train service on the West End line is operated only during rush hours as far as Bay Parkway. (M service terminates at Chambers Street weekday middays.) Even with the supplemental service on the West End at rush hours, New York City Transit never decided to have an express service to Bay Parkway. Probably no other line in the New York City Transit System is as well known as the West End line (save for the #6 in The Taking of Pelham 1-2-3). The West End was used in a major chase scene of the movie The French Connection in 1971 as a car chases the train overhead from Bay 50th nearly all the way to the 60th Street side of the 62nd St. Station. The structure at 9th Avenue is open cut, having rambled through a short rock and brick-lined 2 track tunnel upon exiting from the 4th Avenue subway. Upon exiting the tunnel, the remains of the 5th Ave El ramps (made of concrete) can clearly be seen, followed by a set of similar looking concrete ramps coming from the 36th/38th Street Yard which is on the left side of the train. 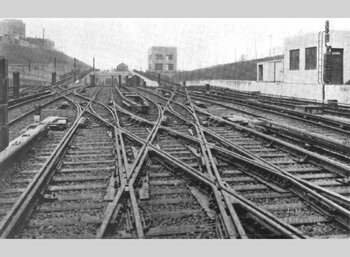 A complicated maze of switches then appears, three tracks which lead to the ex-Culver line stop on the lower level (closed since May 11th, 1975) and three tracks which lead to the upper level for the West End Line, in an open cut. Both levels of 9th Ave have 2 island platforms and one express track down the middle. The West End Line then becomes elevated between 9th Ave and Bay 50th St, using an El structure typically built during the Dual Contracts days. All local stops are side platforms and all express stops are of the island platform type. The express stops are 9th Ave, 62 St, and Bay Parkway; all other stops are local. 62nd Street allows a direct transfer to the Sea Beach Line, which runs in an open cut below. After leaving Bay 50th St, an S curve takes you from the El structure (4.5 miles long) onto grade level, with the massive Coney Island shops right beside you. 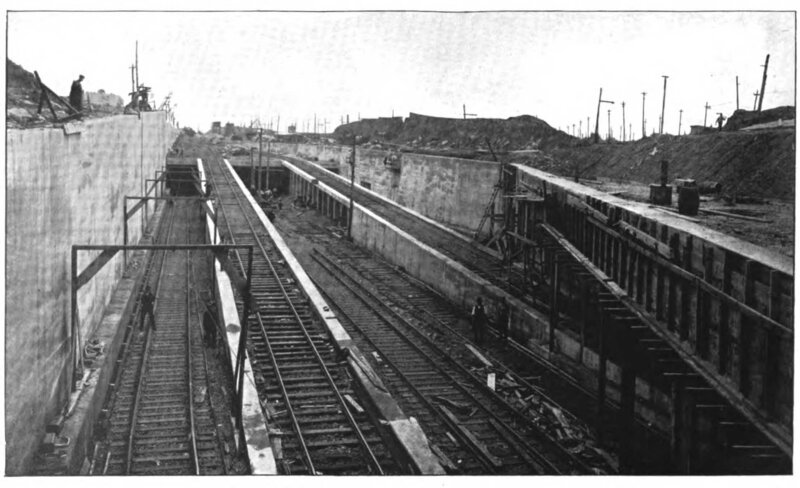 Then the line crosses Coney Island Creek and rises again before entering Stillwell Avenue, the terminal station. 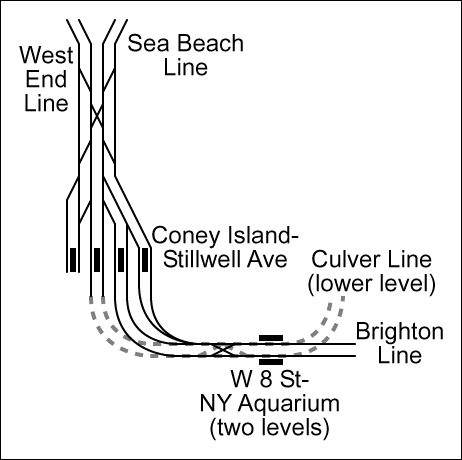 More information about Coney Island-Stillwell Avenue Station available on its own page. This is a three-track extension of the Fourth Avenue subway, from about 38th street to Coney Island. 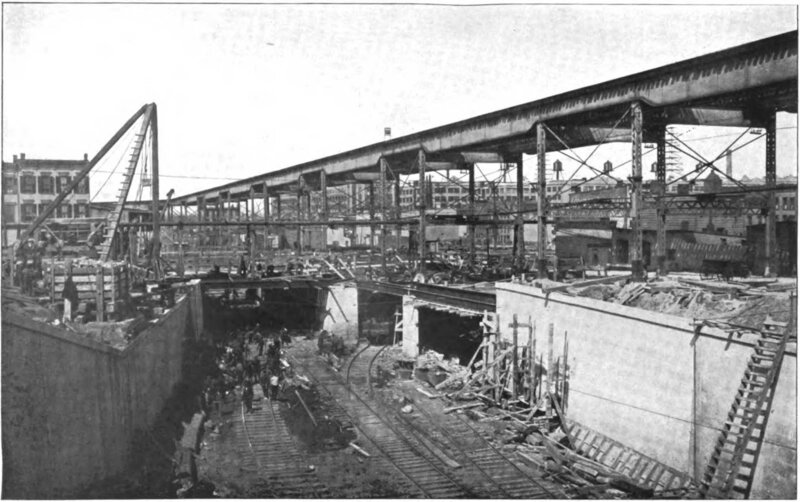 It extends easterly in a cut between 37th and 39th streets to a point near Tenth avenue, where the tracks ascend to an elevated structure, extending thence over Tenth avenue and New Utrecht avenue to 81st street, over private property, to 86th street, and thence over 86th street and Stillwell avenue to a connection at Avenue Y with New York Municipal tracks to Coney Island. This is known as Route No. 39, and is divided into two sections, Nos. 1 and 2. A connection is provided on this line for the Gravesend [McDonald] Avenue line [Culver line]. Route No. 39, Section No. 1. — The connection for this line from the Fourth Avenue subway was shifted from 40th street at the request of the New York Municipal Railway Corporation. That required the reconstruction of a portion of the subway on Fourth avenue between 33d and 38th streets. For convenience this work is included with Route No. 39, Section No. 1. Provision is made on this section also for connection with the Gravesend Avenue line. Under the Dual Contracts, the right of way through which this section runs was turned over to the City for the construction of a rapid transit line which will replace the present service. The company proposes also to build a large yard in the vicinity and make a connection with the Fifth Avenue Elevated line. On account of the necessity of doing the work under traffic conditions and the difficulty of separating construction work, the company, in a supplemental agreement with the City, undertook to do the work of this section at cost. With the approval of the Commission, Jacobs & Davies, Inc., were made construction engineers for the work. This work was begun on February 13, 1914, and was executed on a force account basis at a cost of about $3,000,000. Route No. 39, Section No. 2. 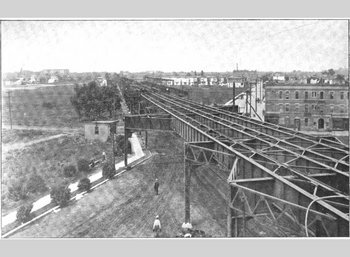 — This a three-track elevated railroad structure extending over Tenth and New Utrecht avenues from 39th to 81st streets; thence over private right of way to 86th street; thence along 86th street and Stillwell avenue to Avenue Y where connection is made with the New York Municipal Railway tracks to Coney Island. Post & McCord, Inc., contractors. Date of contract, December 31, 1913. Contract period, 18 months, extended to June 1, 1916. Summary of con- tractor's bid, $1,672,190. Total cost of contract, $1,682,040.03. 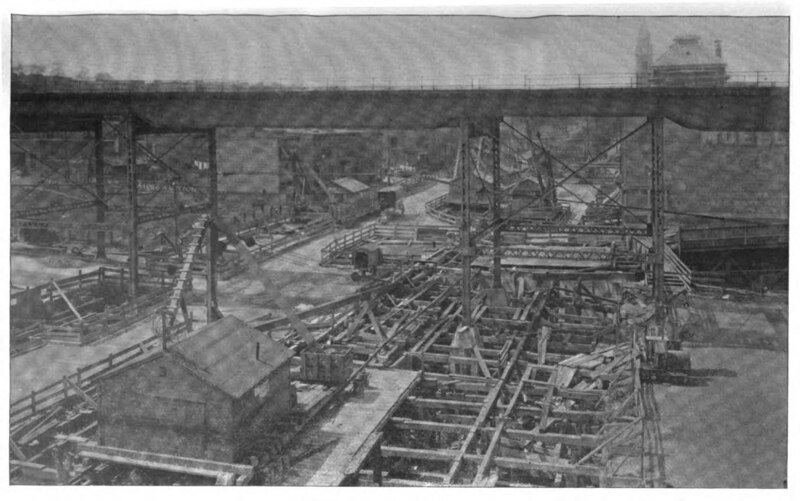 Operation in the 38th street cut started on June 24, 1916, in connection with the operation of the elevated line on New Utrecht avenue, together with the diversion of the Culver Line traffic through the lower level of the Ninth Avenue station, which diversion of traffic took place on June 24, 1916. Of the above lines one of the most important in view of the transportation facilities it provided for a population already large and constantly increasing in an important section of Brooklyn was the New Utretcht Avenue Elevated line. 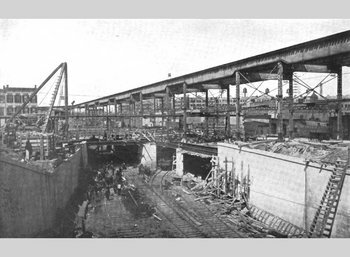 Operation began on June 24, when all-steel-car trains of the type of cars adopted for operation by the New York Consolidated Railroad Company ran through the Fourth Avenue subway and over the New Utrecht Avenue line to 62d street. Regular operation followed immediately after an official special train made a trip over the portion of the new road placed in operation. The New Utrecht Avenue line .... replaces a former line operated as one of the routes of the Brooklyn system and known as the West End line. The latter was a surface railroad which connected with and served as one of the Coney Island extensions of the Fifth Avenue Elevated line. 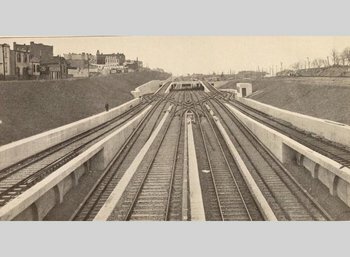 The West End line followed a route along New Utrecht avenue from 37th street and Ninth avenue to 79th street and continued south from that point to Bath Beach and thence westerly to Ulmer Park and Coney Island. From 39th street to Coney Island the old route was abandoned as a rapid transit line and turned into a surface car line. 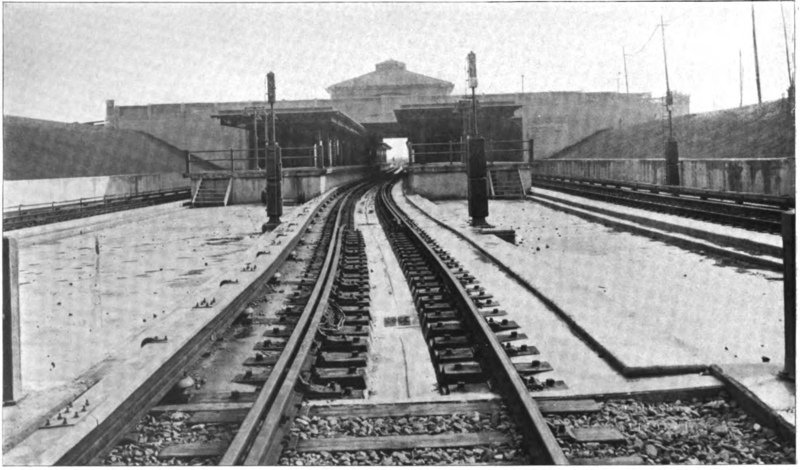 Following immediately upon the opening of the new elevated service, surface car operation began on the old tracks. Interesting ceremonies marked the opening of the New Utrecht Avenue line on June 24. An official party, consisting of representatives of the City, of the Public Service Commission and of the operating company and invited guests boarded a special train and were taken to the 62d Street station. The party included President Dowling of the Board of Aldermen, Commissioner Travis H. Whitney and Secretary James B. Walker of the Public Service Commission, and President Timothy S. Williams of the New York Municipal Railway Corporation. Tke party left the train at 62d street to join in the commemorative exercises at that point. Later at another location a program of pageantry was given, depicting the history of South Brooklyn from its earliest days to the installation of modern rapid transit. New Utrecht Avenue Line. Culver Cut crossing at 38th Street on line of Fourth Avenue Subway. PSC report 1912. New Utrecht Avenue Line. Connection Between Fourth Avenue Subway and Culver Cut at 38th Street. PSC report 1915. New Utrecht Avenue Line. 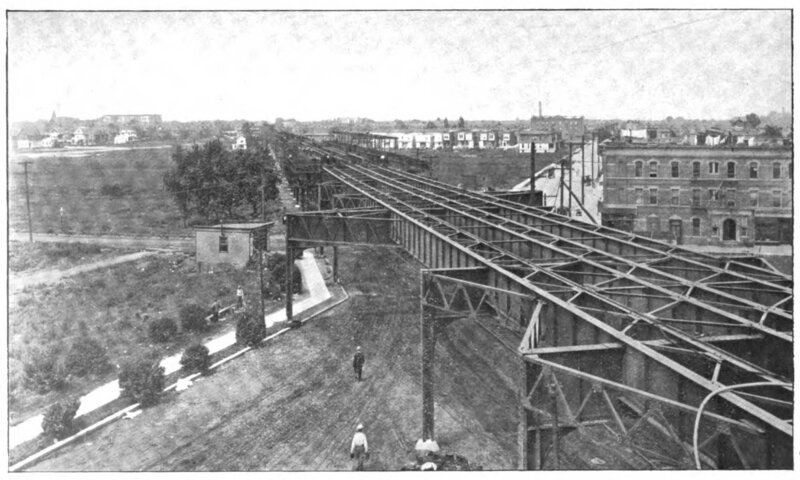 Culver Cut and Inclines for Fifth Avenue "L" Connection. PSC report 1915. New Utrecht Avenue Line. Steel Erected for New Elevated Railroad on New Utrecht Ave. 78th Street Station in the Distance. PSC report 1915. New Utrecht Avenue Line. Erecting Steel Direct from Cars. PSC report 1916. New Utrecht Avenue Line. 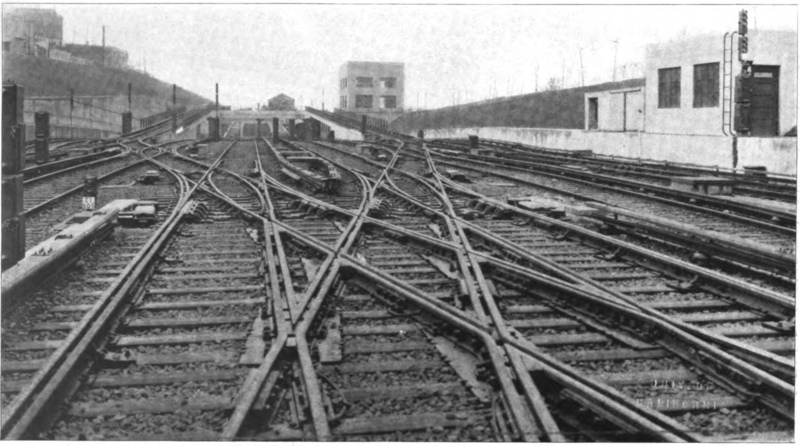 Type of Tracks at West End of Ninth Avenue Station. PSC report 1916. New Utrecht Avenue Line. Special Work in 38th Street Cut. PSC report 1916. New Utrecht Avenue Line. Completed Approaches to Ninth Avenue Station in Culver Cut. PSC report 1916. The elevated West End Line is one of the finest elevated runs in the city. The stations have enough of a distance where decent speed can be attained before stopping at the next one. Photo opportunities exist at 62nd Street, where you can get a good shot of trains approaching from either direction. Another good spot is at 18th Avenue on the Coney Island bound side. Trains can be captured just before they round the curves at either side of the station. The view from 18th Avenue is especially good because this station is a bit above the grade of the line farther south along 86th Street. Even with no train at hand, the views shows how the classical New York elevated line fits into a busy 'downtown' district. At 9th Avenue, the West End Line uses the upper level. There used to be a pedestrian crossing over the center express track at the north side of the station that also provided TA employees access to the 36th Street Yard. Until recently, there was never a "no admittance" sign; in the last few years, one was erected. That perch provided for some great shots of trains coming from the 4th Avenue subway. However, good shots can still be taken from the platform level. An interesting view of the street and underworks of the el are had from the mezzanine and crossunder at Bay Parkway station. On the curve out of the 4th Avenue subway (heading outbound to Coney Island) the line sees daylight for about 50m. Tangent to this curve and merging into it are tracks from piers on the waterfront, operated by the South Brooklyn RR. The line then straightens out heading east into a rock tunnel. It reenters daylight at about 7th Avenue. Then you see the ramps and other railworks leading into 36th Street Yard and Ninth Avenue station. Within the tunnel the line fans out from two to four tracks to separate a West End local service from an express one. Stillwell Avenue offers many varied opportunities for photos and should not be missed. The north end of the station has a pedestrian crossing over all 8 tracks, and the view from the West End side looking north towards Manhattan is the best. Looking south, photos can be taken with the Cyclone rollercoaster or the parachute jump (a New York landmark that used to be part of the 1939-40 World's Fair) in the background. Exit the station at Stillwell Avenue and yet more opportunities are available to you along Stillwell Avenue on the west, Surf Avenue on the South and Neptune Ave on the north sides of the station. (West End and Sea Beach trains depart in a northerly direction over Neptune Avenue). 1862: Opened as the Brooklyn, Bath & Coney Island Railroad. 1885: Reorganized into the Brooklyn, Bath and West End Railroad. 1892: Merged into the Atlantic Avenue Railroad. 1893: Electrified using trolley wire. 1898: Merged into the Nassau Electric Railroad. 1899: Absorbed into the BRT. 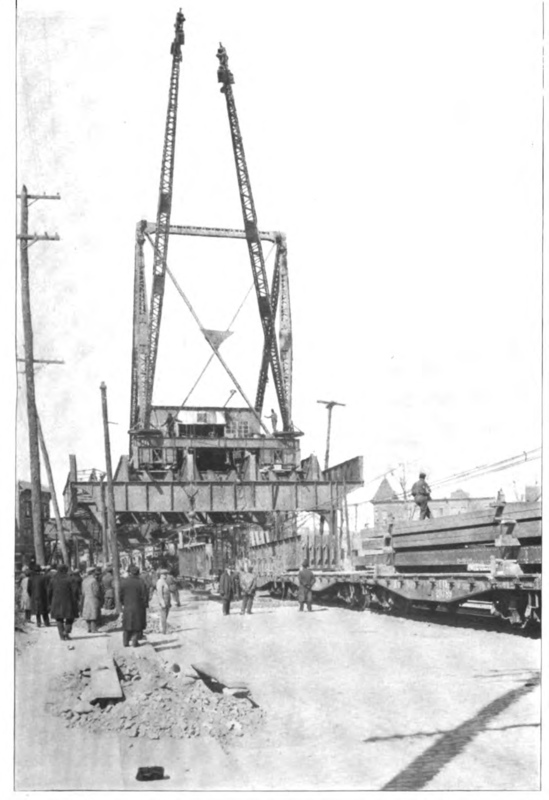 1917: Became part of the New York Consolidated Railroad under the BRT. 1940: Abandonment of 5th Avenue El connection west of 9th Avenue. 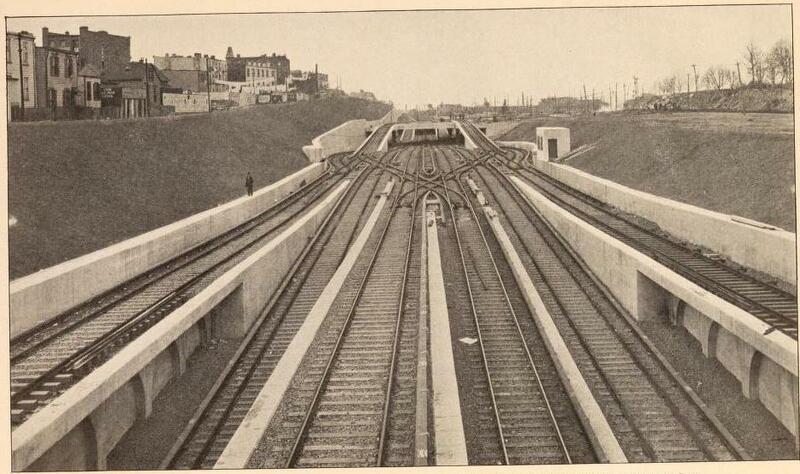 1967 26 November: Chrystie Street connection opens. 1975 May 11: Abandonment of Culver Shuttle connection east of 9th Avenue. Three tracks and two island platforms. Currently the center track is unused in regular service. A careful search of the station found evidence of a possible fourth track at the south end of the southbound platform near signal D515. At the south end is the main exit, with mezzanine and crossover. The mezzanine has casement windows and doors to the fare control from platform and to the street. There are new lights in the mezzanine, but the platforms have old lights at the ridge line of the canopies as well as on the south end past the canopy. The north end has an employee crossover. Also present on each platform are two stairways leading to the BMT Culver Line's closed lower level. The lower platform was last used for Culver Shuttle service which terminated in 1975. East of the station is a small yard used for garbage transfer trains. After departing 9th Avenue, West End line service connects to the BMT 4th Avenue Line subway trunk line. The tracks pass through the 36th/38th Street Yard leads and through a short section of open cut alternating with short tunnels before entering the subway. Artwork Bees for Sunset Park, Christopher Russell, 2012. The 9th Ave. station, lower level, served the original BMT Culver and West End Lines from 1919 to 1954. The IND connection to the Culver Line was made at Ditmas Avenue in 1954, rerouting Culver trains via the new IND subway. The section of track along 39th Street between Ninth Avenue and Ditmas Avenue operated as a shuttle, using the lower level platforms at Ninth Ave. These lower platforms have been disused since the shuttle operation was terminated on May 13, 1975. Since then, only a handful of fan trips have brought passengers into the lower level. It was used in the movie Crocodile Dundee where it posed as the 59th Street subway station. Leaving Ninth Avenue station the line ramps up on fill and then elevated structure into 10th Avenue; this is a right angle turn. The line then enters New Utrecht Avenue with a 30ish degree turn. New Utrecht Avenue begins right at the Ninth Avenue station and some city maps show the West End Line sprouting into existence at the very end of New Utrecht Avenue inside the station. On the inside of the first twist of the S-curve is some kind of cement factory. It commonly sends clouds of dust over the line. Fort Hamilton Parkway station has full windscreen along the platforms. The north exit at 44th Street has only iron maidens and covered up windows. The south exit at 45th Street has a tile mezzanine, crossunder, and heaters. The fare control is of the IND grille type. There does not appear to be an exit to Fort Hamilton Parkway for which the station is named. From this station and all of the others you get wonderful panoramas of the bedroom districts of Brooklyn. The line skirts low apartment blocks, single houses, movie theaters, shopping strips, automobile services, little parks and playgrounds, and lots and lots of trees. Artwork Gardens of Fort Hamilton Parkway Station, Portia Munson, 2012. A very inviting station with no windscreen at the ends. The platforms each have recently-constructed electrical distribution rooms. The exit, in the center of the platforms, leads to a mezzanine with cherry red doors and trim outside (clad wood) and the inside is beige. There are new doors and glass block windows along with heaters. There is an offset in the platforms- especially at the south end. Exit from the center of the platforms. Due to the street layout, the west exit is actually on 13th Avenue. The mezzanine is wood floored with concrete ceiling, which has iron rebar showing through. At New Utrecht Ave., this station is perhaps the highlight of the line. From the two island platforms you can see the BMT Sea Beach Line at the south end. The station has recently been rebuilt. The north exit leads to 61st St., the south exit to 62nd St. and the Sea Beach line. The south exit is unusual; down one level to a crossunder mezzanine below the tracks, then down six more steps to an intermediate level, then down 20 steps to the station house at street level (and down again to the Sea Beach line). The center track here is used only for construction reroutes, as there is no regular express service on this line. A tower and electrical room are at the south end of the northbound platform. Good views are to be had from here south to Coney Island of the Verrazano-Narrows Bridge. Its towers stand some 630 feet above the water and are visible from all over the southwest quarter of Brooklyn. Artwork Nature Rail, Andrea Dezsö, 2012. This local station has no windscreen at the north end, and on the south end only on the northbound platforms. The north exit is at 70th Street, with a closed mezzanine like at 79th Street. South exit at 71st Street has a wood floor and beige clad wood walls. At the fare control the floor is concrete over wood. Artwork The Flora of Bensonhurst, Joan Linder, 2012. The north exit is at 77th Street and has a full mezzanine (which is now closed and used for storage). An iron maiden turnstile is now present. The south exit at 79th Street has a wood floor and beige clad wood walls. At the fare control the floor is concrete over wood. The platforms have full windscreen. Artwork A Continuous Thread, Susanna Starr, 2012. There is no windscreen on the southbound platform at the south end. The exit is in the center. The mezzanine resembles that at 20th Ave, and there are exits to the north and south sides of 85th Street at 18th Avenue. There are heaters in the mezzanine. At each end of the station the elevated trackway curves allowing nice views of approaching trains. Artwork Bensonhurst Gardens, Francesco Simeti, 2012. The mezzanine has wood floors and clad wood walls, with concrete over wood flooring. There are north and south exits to 86th Street on each side of the mezzanine. The ends of the platforms are offset and have full windscreen. Artwork Kaleidoscope, Odili Donald Odita, 2012. Two island platforms and three tracks. This is a very ornamental station spoiled by huge billboards plastered on both sides. The structure across Bay Parkway (also called 22nd Avenue) is concrete with geometric details. The center track is used only occasionally for construction reroutes. Although the "M" train service from Metropolitan Avenue terminates here during rush hours, the switches are not present on the north side of the station to allow trains to terminate on the center track. There is a tower at both ends of the station as well as late 50s style mushroom lights at the south end. The ends have escaped windscreen. The mezzanine is metal with concrete floors, the side walls are tile over concrete and the windows have been covered over. This station is located in a vibrant Italian neighborhood with lots of old world flavor. Good views of the street scene are had from the mezzanine and exit stairs. Artwork Tree of Life, Xin Song, 2012. The exit is at the north end. The mezzanine has metal walls and wood flooring. There are doors to the platform and street. There is full windscreen. Artwork Rediscovery, Amy Cheng, 2012. The exit is at the south end and its mezzanine is constructed of metal walls and wood flooring. There is a full windscreen. On the northbound platform there is a doorway in the windscreen leading to the catwalk on the yard tracks and there there is a tower at the north end. At the south end of the station there are leads into Coney Island Yard and the "running" line becomes two tracks: the southbound track merges with the center track. Artwork Internal Connectivity, Dan Zeller, 2012. By Mark S. Feinman, Peggy Darlington, David Pirmann, and Ed Sachs.